Cromnibus pot laws: Washington has quietly become much more pro-pot that it appears. Despite Congress’ attempts to block D.C.’s legalization, there’s a major pro-pot provision hidden in the 2015 spending bill. 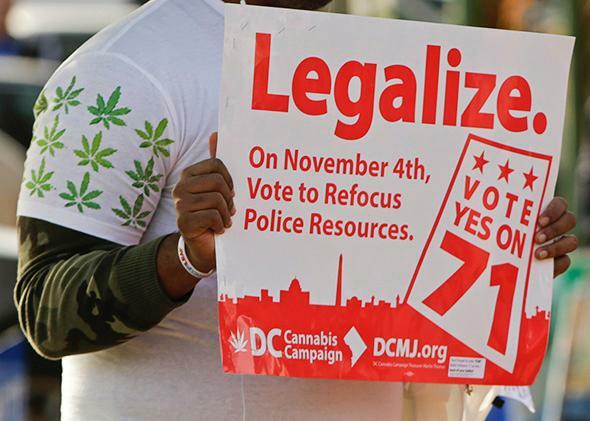 A supporter of marijuana legalization holds a sign outside a polling station in Washington, D.C., on Nov. 4, 2014. Late Thursday night, the Republican-controlled House pushed through a $1.1-trillion spending package to keep the government’s lights on through next summer. The Democratic-controlled Senate is expected to do the same before they head home for the holidays. Among the myriad policy riders buried inside the 1,600-plus-page bill is one aimed at blocking the Washington, D.C., City Council from legalizing recreational marijuana, something voters in the district instructed them to do by a margin of nearly 2-to-1 last month. But despite that symbolic victory, it’s a different pot-themed provision tucked deep inside the bill that offers a more accurate illustration of Washington’s evolving position on legal weed—the Capitol’s posture is quietly becoming much more supportive than the effort to block D.C.’s legalization effort might suggest. That less-discussed provision stops the Justice Department from spending a dime to prosecute patients or medical marijuana dispensaries that are acting in accordance with state law but running afoul of federal ones. The policy change might not make for splashy headlines, but it promises to have a major impact on the medical marijuana movement around the nation. The federal government still classifies pot as a Schedule I substance—as it does heroin—one the Drug Enforcement Administration says has “no currently accepted medical use.” And while President Obama has given a qualified green light to states to experiment with both retail and medical weed, that hasn’t stopped the DEA and several U.S. attorneys in recent years from raiding hundreds of medical dispensaries that were in compliance with state laws. Pro-pot advocates hope the spending bill should make such crackdowns a thing of the past. The provision could also derail a number of pending prosecutions currently winding their way through the legal system, including the federal case against the so-called Kettle Falls Five, a small group of friends and family facing mandatory 10-year prison terms for growing medical weed on their farm in eastern Washington. Nearly as noteworthy as the medical marijuana decision is the states-rights logic that is driving support from the Republican side of the aisle. “The enactment of this legislation will mark the first time in decades that the federal government has curtailed its oppressive prohibition of marijuana and has instead taken an approach to respect the many states that have permitted the use of medical marijuana to some degree,” Rep. Dana Rohrabacher, the California Republican who was part of the bipartisan effort to include the medical marijuana language in the larger spending bill, said in a statement this week. Suggestions of “oppressive prohibition” aside, Obama has actually given states remarkable leeway to experiment with weed, even if he’s refused to give them an unqualified free pass to do so. His administration has largely taken a wait-and-see approach to retail markets like those already underway in Colorado and Washington state, and his administration has likewise taken small steps to encourage banks to do business with those companies involved in the quasi-legal pot trade. Those actions haven’t been without their conservative critics, of course. Republicans have repeatedly blasted Obama for not enforcing statutes that are on the books, be they immigration laws or drug ones. The so-called Enforce the Law Act that the House passed earlier this year included a committee report that criticized Obama for his laissez faire approach in Colorado and Washington state. And the D.C. ban makes it clear that there are plenty of GOP lawmakers who remain strongly opposed to legalized weed of any kind. Still, it’s telling that the biggest pot-related fight this week was over explicit legalization in the nation’s capital, while a sweeping provision that could fundamentally reshape how the federal government treats medical marijuana slipped through with hardly a peep. That just goes to show how far the battle lines have shifted in the favor of the pro-pot crowd and suggests that, in spite of the potential setback in the District itself, the future for their side in Washington is a brighter one.